In America, retail stores have been on the decline for some time, with many of the old standbys getting squeezed out by online retailers. And one piece of the classic American landscape that's on the way out is the shopping mall. Once the hub of most suburban communities, today, many once-thriving shopping malls have since gone belly up, turning from a bustling social meeting place to eerie reminders of the decline of brick-and-mortar retail. 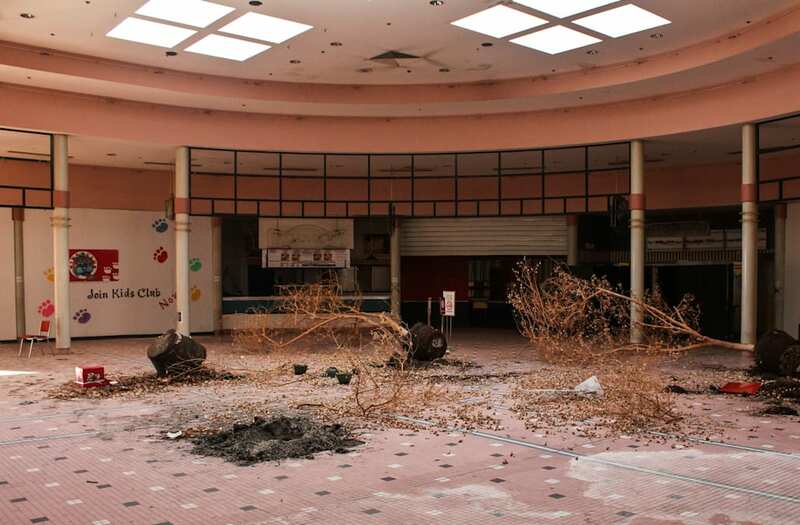 Click through to look at what some of the dead and abandoned malls of America look like after the economy has passed them by. An inside look at malls dying across the U.S.
Rolling Acres, originally opened in 1975, once boasted a three-screen movie theater, full-service food court, 140 total stores and four major department stores, but things have been on the decline financially and otherwise for some time. The mall has changed ownership several times, had the lights shut off for non-payment of its electricity bill in 2008, saw a man electrocuted trying to steal copper wire in 2011, and finally, the city of Akron started demolition of the space in October 2016. Cloverleaf Mall — Richmond, Va. The first phase of the Cloverleaf Mall had its grand opening in 1972 with 42 stores anchored by mega-retailers JCPenney and Sears, and a second phase opening a year later with what was, at the time, the largest JCPenney's store in the state. However, business began to erode in the 1990s when two clerks were murdered during an apparent robbery of an All for One store and the nearby Chesterfield Towne Center was renovated. Cloverleaf Mall closed its doors for good in 2008. North Towne Square opened in north Toledo in 1980, anchored by a Montgomery Ward, Hudson's and Lion stores, but the mall went into decline, was condemned and eventually demolished in 2013. As of last year, though, the former site has been rezoned for industrial use with an eye toward "outdoor vehicular storage." Dixie Square Mall — Harvey, Ill. The Dixie Square Mall's time as a retail center was short-lived: After opening in 1966, it closed just 13 years later. However, it should be familiar to plenty of cinema fans: It was featured in the famous scene where Jake and Elwood lead a police chase through a shopping mall in the 1980 classic comedy "The Blues Brothers." McFarland Mall — Tuscaloosa, Ala. Opened by James Hinton, Sr. and Ward McFarland in February 1969, the McFarland Mall survived through the increased competition when nearby University Mall opened just eight years later and had four anchor stores, a 12-screen movie theater, food court and 40 other retail locations at its peak. However, declining business led to the mall slowly declining until, as of 2017, a Dollar Tree was the only remaining store that was open. Manchester Parkade — Manchester, Conn. The Manchester Parkade opened in 1957 and has been at Broad Street and Middle Turnpike ever since. However, its lack of proximity to the highway has proved to be a problem over the years. After the opening of the Buckland Hills Mall in 1990, business slowly eroded over the next decade. The site was torn down in 2012. Macon Mall — Macon, Ga. Built in 1975, the Macon Mall has been serving residents of Macon, Ga. for over 40 years. However, while it's still in business today, times have been tough. JCPenney announced last year that the Macon Mall's anchor store would be one of 138 that it was closing, adding to the closures of Sears and Belk in 2012. Charlestowne Mall — St. Charles, Ill. The Charlestowne Mall in St. Charles, Ill. actually has all three of its anchors — Von Maur, Carson's and Classic Cinemas — still open for business, but the interior closed in December of 2017. There are plans to redevelop the property for a combination of residential, retail and commercial use. Metcalf South Shopping Center — Overland Park, Kan. The Metcalf South Shopping Center held its grand opening in 1967, but it has since fallen into disrepair. The mall, largely vacant since 2014, was torn down in 2017 in favor of a Lowe's surrounded by as many as 14 small retail or office buildings. Frederick Towne Mall — Frederick, Md. Frederick, Md. 's Frederick Towne Mall has been vacant since 2013, but there are plans to bring back the location, which sold for more than $6 million in early 2017, as a Warehouse Cinemas. Blue Ridge Mall — Independence, Mo. When the Blue Ridge Mall first opened in 1958 is was an open-air shopping center, but it transitioned to an enclosed space in the 1970s. However, fleeing retailers led to a long decline and the mall was torn down to make way for Blue Ridge Crossing — which is anchored by a Walmart Supercenter — in 2005. Nanuet Mall — Nanuet, N.Y. The 900,000-square-foot Nanuet Mall had some 120 stores in operation as recently as 1999, but it fell on hard times not long after that when the Palisades Center opened in nearby West Nyack and drew away business. The mall closed in 2012 for redevelopment into an outdoor shopping center. ShoppingTown Mall — Dewitt, N.Y. The ShoppingTown Mall in Dewitt, N.Y. first opened in 1954 as an outdoor strip shopping center only to convert to an enclosed mall in 1975. At the time of the enclosure, 72 percent of the 99 tenants were retail stores, jumping to 122 tenants by 1991. However, that dipped to 64 tenants by 2016, only 37 percent of which were retailers, and the mall now owes $5.7 million in back taxes. Innsbruck Mall — Asheville, N.C. Built in 1966, the 213,000-square-foot Innsbruck Mall still had a 100 percent occupancy rate on its ground floor as recently as 2015. More recently, though, commercial real estate developers have plans to make the location a "mixed-use lifestyle center." Eastland Mall — Tulsa, Okla.
Eastland Mall near Tulsa, Okla. was a dead mall until Gerry Chauvin — who has converted at least six dead malls into new businesses — redeveloped it into the Eastgate Metroplex. As of 2016, the space had an occupancy rate of 72 percent for its 900,000-square-foot facility. Century III Mall — West Mifflin, Pa. The opening of Century III Mall in 1979 marked the end of a decade-long project to build a 1.6 million-square-foot retail hub that was, at the time of its completion, the third-largest enclosed mall in the world. However, the mall — named for the U.S. bicentennial in 1976 (the nation was entering its third century) — now has just 19 stores operating on its premises and closed its famous carousel in April. Richland Mall — Columbia, S.C. The Richland Mall, first built in 1988, is still home to a handful of stores, including the Columbia Children's Theater, but still has large swaths of its retail space sitting unoccupied, as of April 2017. Fort Henry Mall — Kingsport, Tenn. Originally opened in the mid-1970s, the Fort Henry Mall has changed its name back to the original after existing as the Kingsport Town Center for some time. The Hull Property Group purchased the mall in June 2016 with plans to renovate it and shift to an apparel-based retail strategy. Hickory Hollow Mall — Antioch, Tenn.
Now known as the Global Mall at the Crossings, the two-tier Hickory Hollow Mall opened in 1978. However, after years of relative success, the mall started losing its anchor stores, with JCPenney exiting in 2006, Dillard's in 2008 and then Sears and Macy's in 2011. Click to find out how much the 100 top-selling retail stores in the U.S. earn. Rachel Farrow contributed to the reporting for this article.